WWE will release “Then, Now, Forever: The Evolution of WWE’s Women’s Division” on DVD in just over 2 weeks’ time so let’s get a first look at it, shall we? You can pre-order WWE’s first-ever 3-disc DVD collection on women’s wrestling for $19.99 in the United States (here on Amazon.com) or £21.99 in the United Kingdom (here on Amazon.co.uk). These are a small preview of “Spotlight” segments found between every match on the new DVD which highlight one or more female stars influential in WWE’s women’s division either in the past or in the present day. Like for Victoria and Mickie James, these chapters will feature new interview footage, where possible, with the Superstar being spotlighted. And as you saw it’s not just an interview, it’s more of a documentary-style piece for each woman! “Then, Now, Forever: The Evolution of WWE’s Women’s Division” will present that documentary material on top of more than 20 full-length matches involving the greatest female performers in company history including the likes of Wendi Richter, Sensational Sherri, Chyna, Trish Stratus, Lita, AJ Lee, Paige, The Bellas Twins, Charlotte Flair, Sasha Banks and Ronda Rousey. – UK/Europe: June 25th. Pre-order the WWE Women’s DVD right now on Amazon.co.uk. 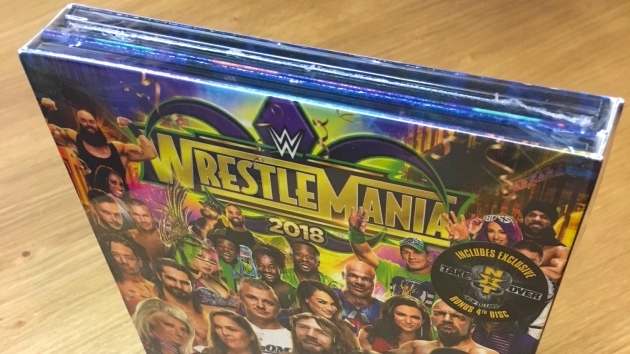 We’re tag teaming with WWE Home Video UK to bring you the chance to win the newly-released WrestleMania 34 DVD and a “Rowdy” Ronda Rousey T-Shirt to go along with it! Entry is easy – head to our Facebook page and give the competition post a ‘Like’ then leave a comment on it naming the opponent you would most like to see Ronda Rousey face in the ring next after Nia Jax at Money in the Bank. Will Ronda be RAW Women’s Champion by that time? Get in quick with your entry because this special WWE DVD giveaway expires this coming Monday, June 11th. Following the Women’s Evolution DVD out later this month WWE’s next big 3-disc DVD set will be “The Shield – Justice for All” compiling nearly 20 of Dean Ambrose, Seth Rollins and Roman Reigns’ best matches in the past few years and several new interview segments with the trio. 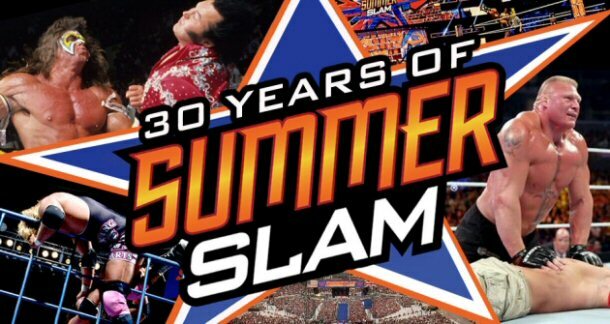 Heads up, the new WWE “30 Years of SummerSlam” DVD is now available to pre-order in the United States in the same week we exclusively revealed its full content listing. Amazon.com is now listing it for release on August 28th. In case you missed our earlier updates, this will be a 3-disc set featuring 18 historic SummerSlam matches and host segments on top. The official cover artwork and trailer for this one should be along soon! GRR coming out in November is a joke. The guys running the WWE DVD department have killed it. Personally I stopped collecting after 20 years when Fremantle blocked me for saying release times are too long in the network era. Maybe they need 6 months to edit all the botched moves out. Sounds like they just blocked you for being a d*ck, to be honest. Plus, I thought the phrase “killing it” denoted a positive thing nowadays? Lastly, if you don’t collect anymore, why do you still have any interest in this site? Surely it’s better to wait til November for GRR than to not get it at all. Fremantle have got releases out a damn sight quicker than Silver Vision did. Mania used to be released in early July. Now it’s early June. Not to mention that we get digipaks, NXT Takeover and alternative artwork. I miss Silver Vision but Fremantle are far from the worst distributor out there. Just ask the collectors in the US with their slimline cases and discs stacked one on top of the other. Maybe they shouldn’t even release that joke of an event at all and just shelve it. This will be a great set. But it will not be the last. There will be a volume 2 but it’ll probably be out sometime next year. What evidence do you have to confirm that there “will be” a Volume 2? With the DVDs yet to be released (Shield, Women’s Evolution, and Summerslam set), I think I’m actually most excited for the Women’s Evolution, which I did not expect in the least. A women’s set has been overdue and I found the content for Shield and Summerslam to be pretty sub-par. I totally agree with you on this. Not exactly excited about another Shield DVD or the SS DVD. If they could make the SS release a documentary then I would be excited for it. At least it isn’t a top 30 countdown. Wish SSlam was like the True WM Story in that there was a documentary on the event’s history as I think SSlam is big enough now (if it wasn’t before) to warrant a documentary. It’s so big now in fact that even Stone Cold calls it “the WM of the summer,” Considering all the hype and everything that WWE gives SSlam, they give it the WM treatment? I’d say Austin is accurate w/his statement. The Shield, I love them. Wish they didn’t break when they did but understand why they did and it worked best for Rollins at the time. But this reunion wasn’t as big/impactful even with Kurt Angle as their partner at TLC as their original run was. The reunion didn’t even last as long either. To be fair that may or may not have been the plan all along. In any case it didn’t last long due to problems Reigns and later Ambrose had. All that said though I find the Shield set much like the SSlam dvd considering the missing matches from the SSlam set to be cash grab.